Diver Jan doll? You guys try to scare little children with something which looks like me ? Seriously, I really appreciate your ideas and suggestions, maybe, just maybe with all the collective wisdom here, solution can be found. Thank you very much..
Sounder wrote: If you ever do print them, I think we could make a "Diver Jan" doll that looks just like your cartoons. They'd sell out at the Aquarium (if not on the websites like these first)! Yeah.. I thought on Smugmug you could have the ability to let people purchase your photos.. I bet if you started doing something like that you'd quickly find that you had enough money for publishing. I bet the NWD clubbers alone would get enough for that first run at a real book, for say the aquarium.. But Sounder gets a little of the royalty rights for thinking of the Jan doll because that's just brilliant!! 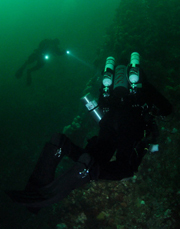 Yes, that was the verdict of our exploration dive at Possession Point Beach -- Not much there. Too bad, because it's such a nice site, with parking, picnic tables, showers and a super easy entry. Oh well . . .
What we should do with Jan's pages is make a website with all of them there, and you can download the files for some reasonable fee. Then we can take the files to Kinkos or somewhere and get them printed out on high quality paper. That way, we could keep up with the output -- In fact, people could even subscribe to the series in some way (so much a month, or year, for downloading all the pages). This would keep Jan's costs to almost nothing (he uploads the files already), get him some income that would help support his hobby, and give all of us access to these beautiful pages in a size and format that would do them justice. What do you think, Jan? As soon as you printed one, it'd be out-dated!!! I love how often you share your pictures and clever art with us! 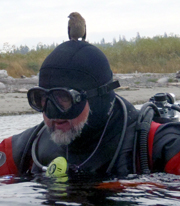 If you ever do print them, I think we could make a "Diver Jan" doll that looks just like your cartoons. 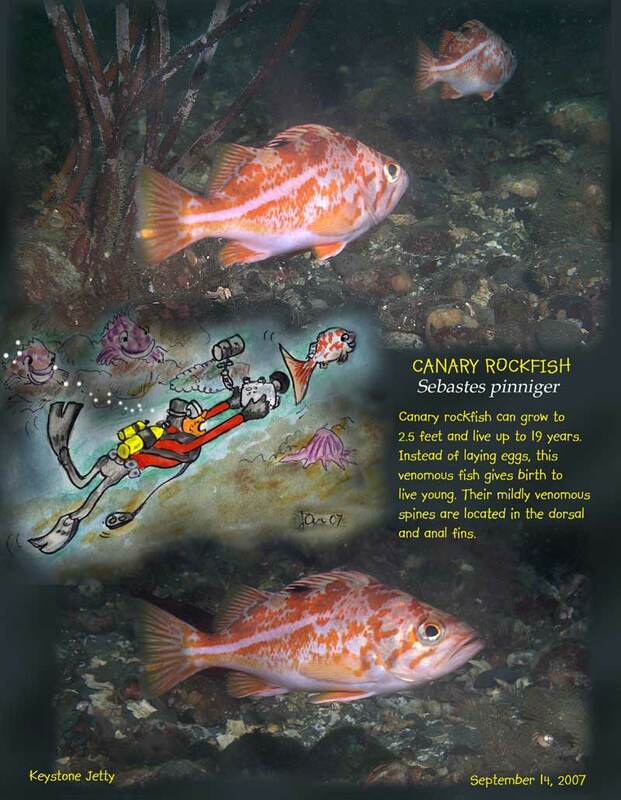 They'd sell out at the Aquarium (if not on the websites like these first)! LCF wrote: It is simply a crime that these aren't collected somewhere in full size, for people to leaf through and marvel at. John Rawlings wrote: Hi, Jan! Beautiful shots! The sand almost appears to be black - is there something in the vicinity that would account for that? Thank you John. Possession beach is on the south end of Whidbey, take Cultus road to Possession Road, there are signs to guide you to the park. I got turned onto this by Lynn (LCF) right here on this forum. 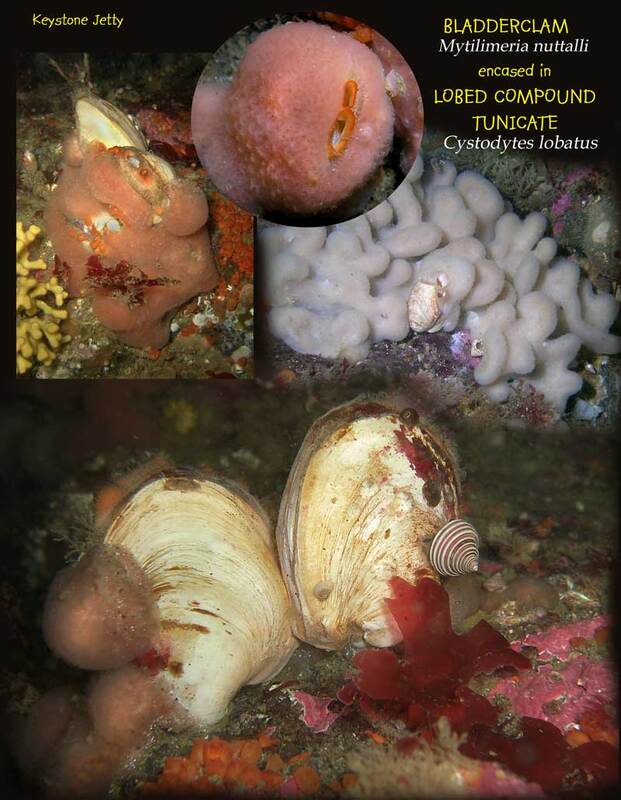 It seems to be current sensitive (explains the seapens), I did not find much of anything else, Sea Pens and their enemy, the Striped Nudibranchs. Few Sunflower stars, one very skittish Dungeness crab. What I found interesting, was that the baby pens were in the shallows, closer to Eel grass and in very murky waters, while I did not see any of the babies among the adults in deeper water..
Beautiful shots! The sand almost appears to be black - is there something in the vicinity that would account for that? Where exactly is Possession Beach? 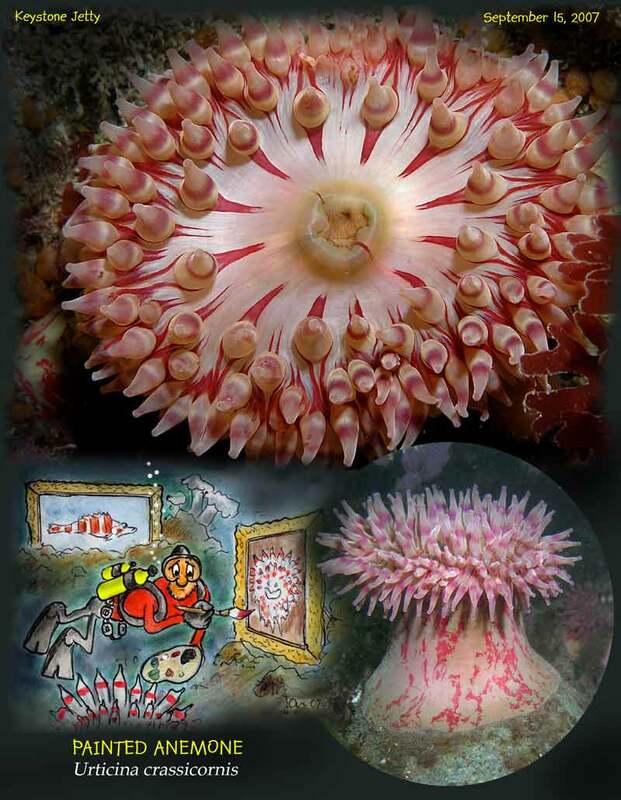 Is there anything else there along with the Sea Pens? Thank you for kind words. 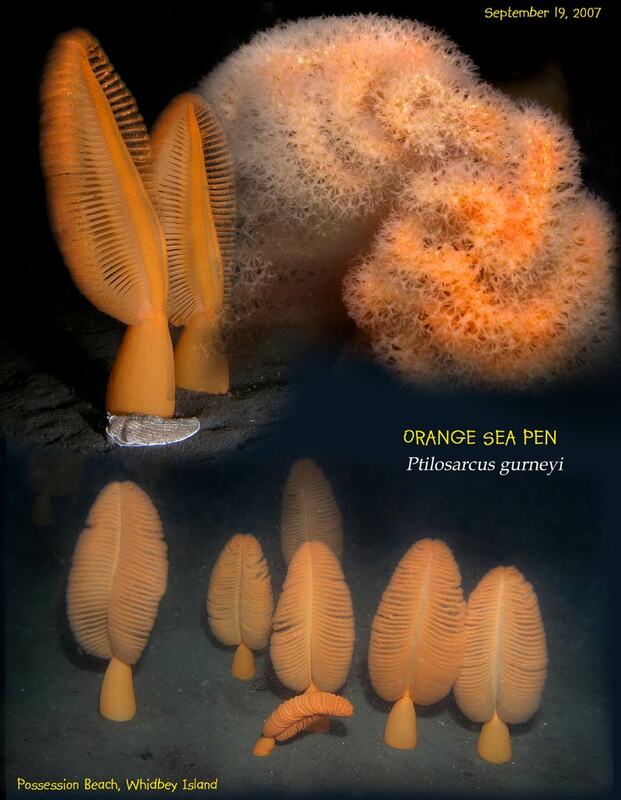 Enjoy some more of the Orange Sea Pens. Beautiful.. reminds me of my feeling of being on another planet when I'm down there. 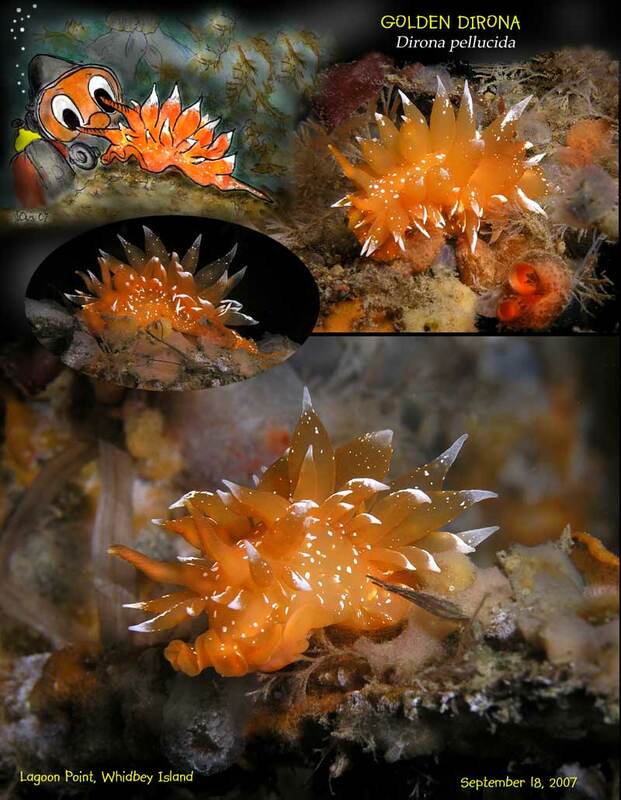 Jan, I have loved your pages since I first found them, but those Golden Dirona shots may be some of the most incredibly sharp and colorful I've seen yet. 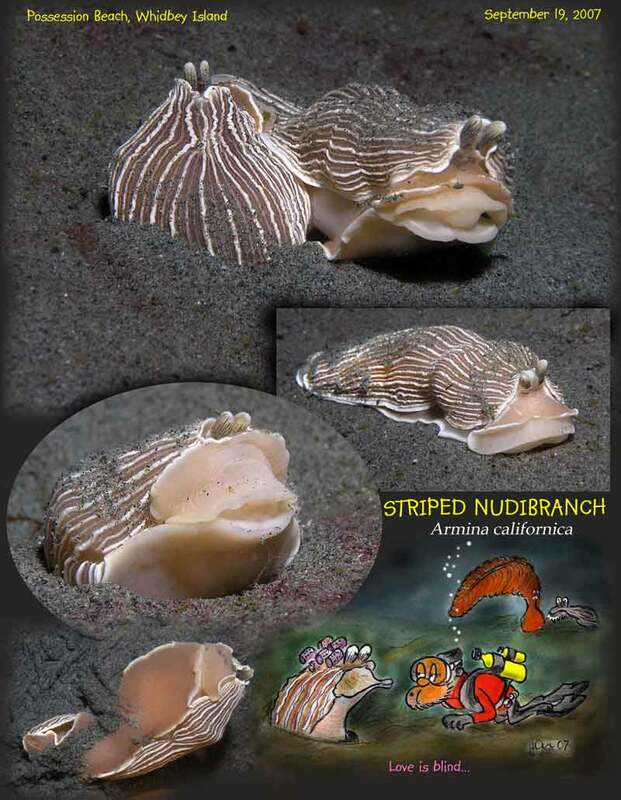 Although you really won my heart with that sea pen/striped nudibranch picture. 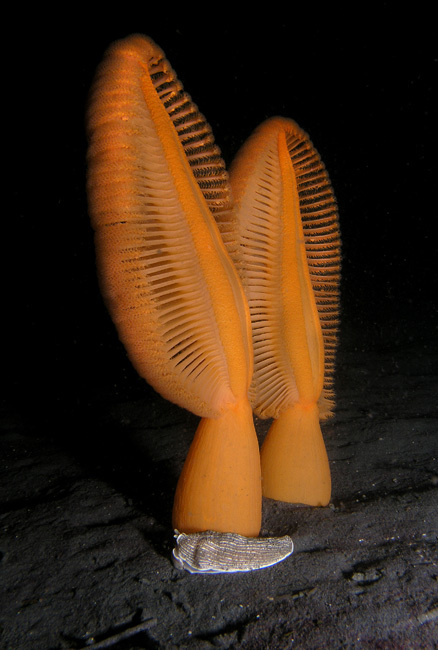 I love the big sea pens -- They are so delicate and soft, and so vividly orange. Yours stand out so beautifully against the dark water background. That's just a stunning picture. It is simply a crime that these aren't collected somewhere in full size, for people to leaf through and marvel at. Thanks Nailer for saving me, that depth rapture is a terrible thing, after all, I am a married man! JAN! PUT YOUR REG BACK IN YOUR MOUTH! YOU'RE JUST NARC'ED!!! THAT NUDI DOESN'T LIKE YOU "THAT WAY!" John Rawlings wrote: Simply gorgeous work, Jan, as always! I'm SO glad that you share your art with us here! Ditto. 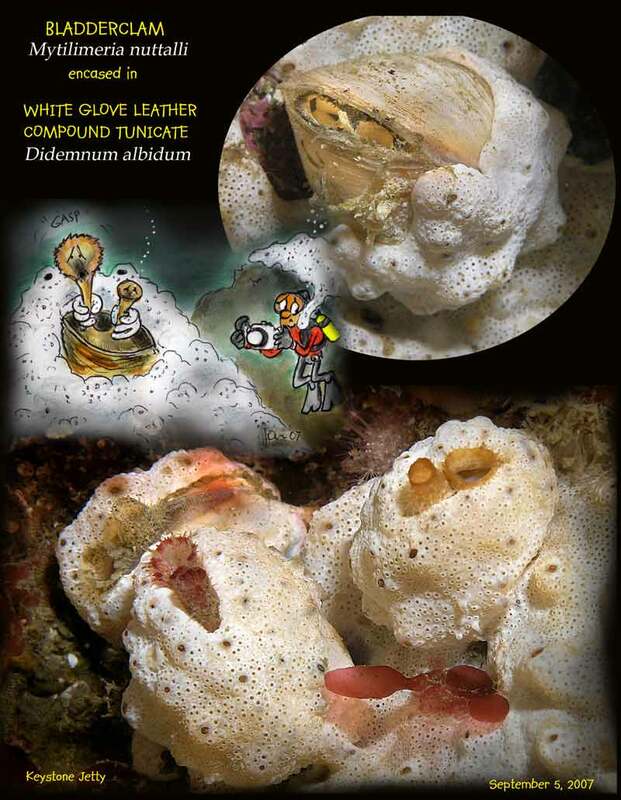 I must say, I'm no genius when it comes to identifying life forms underwater, but more than half of the ones I can ID, I learned from this thread right here. I love your work, and your playfull sense of humor, Jan! Thanks for sharing it with us! Finally found Golden Dirona on Whidbey Island. Always happy to add another critter to my list of locals. Last edited by Jan K on Fri Sep 21, 2007 5:17 pm, edited 1 time in total. Oh, glad to see you went and tried the dive there! 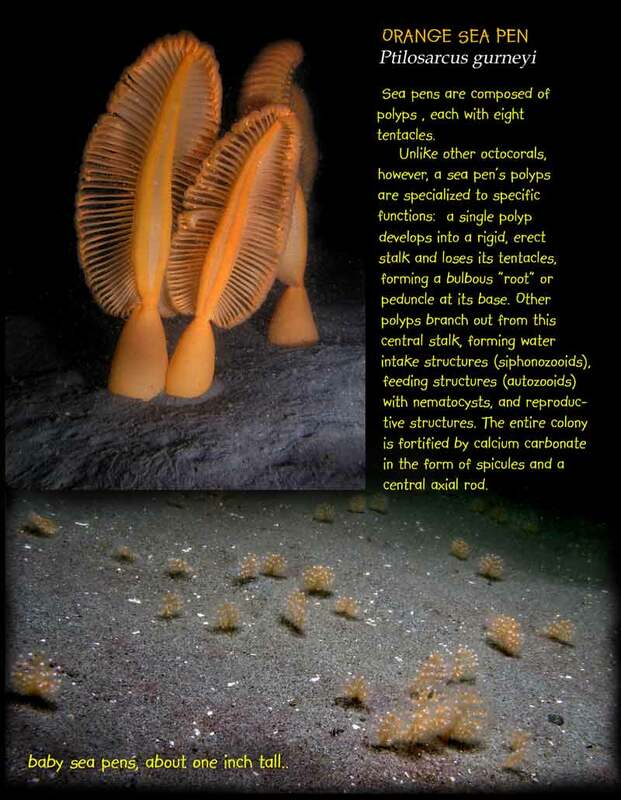 Those are amazing fields of sea pens, aren't they? Ah, were all our Sundays slow ones... and as beautiful as yours! Yes, this thread is one I open every time I come here, to see if Jan has added anything new! Agreed! I find myself eagerly awaiting each new installment. Beauty is good for the soul, and you take beautiful pictures of beautiful stuff then do beautiful (and usually humorous) things with them!